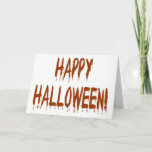 Halloween cards that have text of dripping blood, gore, skeletons, ghost, the dead, spider fingers, and fun festive party text and more fun text on cards you can customize. 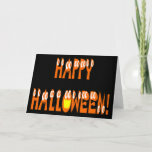 Who said that Halloween cards have to have characters of bats, witches, ghost and goblins? 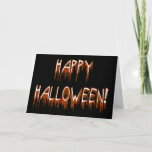 A creepy, scary or fun text that expresses this holiday makes a great style on any Halloween gift of shirts, key chains, magnets and even greeting cards. 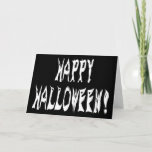 The print on demand shop Zazzle, offers many scary and nifty fonts to create your own Halloween card. That is why my A to Z You & Me Shop (atozunme) has a product line called "Custom A to Z Letters & Names" build in. In this product line, you can customize any of the types of products and add your own text and or image. 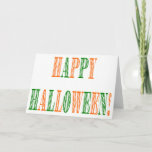 Since Halloween is the next major holiday coming up, see if you can make a Happy Halloween text card better than any of the cards that show in my shop. Playing with different fonts is fun. I have always been fascinated on the look that can be achieved with just text. My Zazzle shop is unique in that the focus is all about text. Specialty fonts added that Zazzle does not offer are in the product lines for monogram initials, names and holidays within A to Z You & Me Shop. Look at my Holiday product line under Halloween. Twelve scary, creepy and fun fonts say, "Happy Halloween!" What more can you ask for in a special greeting card to send to your friends and family and if you want more than the cards with these unique text images, the t-shirts took boo good too. 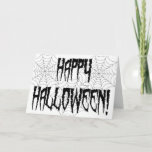 Known to the internet world as Sandyspider, the Spider Fingers and Web is one of my favorites in greeting cards. No Halloween is complete without spiders and sticky spider webs to be stuck into, just try to get out of that! 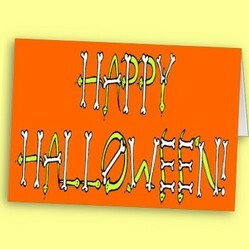 Send out a festival Halloween card to send out for your next party or the postcard with the same design. This makes me feel like getting out the spider cupcakes and gruelingly delicious punch. Food and drinks is always a crowd pleaser. Blood dripping Happy Halloween and suffering text, just makes me yearn to watch the most frightening horror movie with lots of blood and gore. Close your windows and don't answer the door. Watch out for things that bite (vampires, zombies, monsters). Happy Halloween with ghost, spooky spirits good and bad ready to give a Boo to you. Watch out for those Jack o' Lanterns, they are not all friendly. Sandyspider Gifts (sandyspider): Thousands of customizable products offered here from Holidays, nature, animals, sports, food, internet addiction, humor and more. A to Z You & Me Shop (atozunme): Monograms and names for any occasion. Fancy, unique and fun fonts. Majority of these are images that Zazzle does not carry as a font.. Funnyjokes Shop (funnyjokes): Funny quotes, insults, jokes, insulting humor, memory lapse, elderly jokes and more humor to follow. Kingdom of Animals (kingdomofanimals): This is a shop specializing in animals of all kinds Including domestic and wildlife. Check out the Halloween pets here. Travel Destinations (traveldestinations): Everyone loves to travel. Personally, I would love to travel to all 50 states and explore outside countries. Write Art and Business Logos (writeartlogos): eBook covers I have designed for Writers who would like to see their covers on gift products. sandyspider, Thank you, as always, for the timely practicalities and products. Do you have special recipes for your Halloween punch and spider cupcakes? DerdriuMarriner, Just let people...a Jack O' Lantern could have a friendly face. But deep down, it is a mask for something evil. Not always easy to tell. sandyspider, By the way, I meant to say last time that I really love your statement "Watch out for those Jack o' Lanterns, they are not all friendly." How do you tell the difference? DerdriuMarriner, Spider webs can do that. sandyspider, Nice ideas, particularly in terms of the fonts! In a different direction, isn't it interesting how spider webs can make a room look quite creepy when in reality beneficial spiders' webs probably keep potentially worse arthropods out?